With a four year industry hitus in the Paint and Pigment industry working for Dulux, ICI, Australia Dr. Martin's research has been in the area of metals - primarily toxic metals in biological systems. This includes research in the laboratory of Dr. Peter Lay at the University of Sydney synthesizing novel Cr(V) compounds and studying chromium and vanadium mutation rates in Salmonella Typhimurium as well as a PhD with Dr. Karen Wetterhahn at Dartmouth College in 1998, looking into the toxicity and metabolism of chromium, arsenic and cadmium compounds in human lung cells. From 1998-2000 she was an American Heart Association Postdoctoral fellow in the Division of Cell Biology at the University of Utah Medical School, studying iron and copper metabolism and the way toxic metals could utilise essential metal delivery systems. 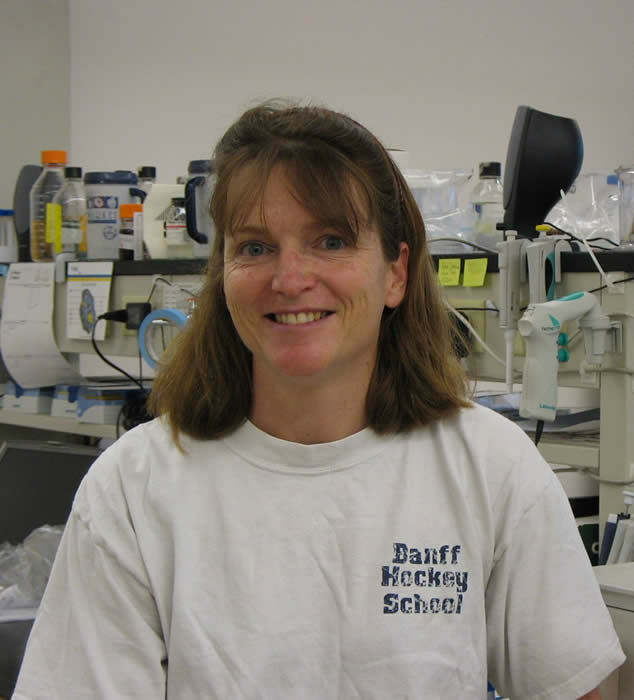 Dr. Martin moved to the University of Montana in 2000 as a postdoctoral fellow in the laboratory of Dr. Kent Sugden. She is now a Research Associate Professor in the Department of Chemistry. My research interest remains the study of toxic metals in biological systems, particularly with regard to modifcations of DNA and its consequences, including repair and carcinogenesis. Toxic metals in biologicals systems and the cellular response to DNA modification. Shafirovich, V. Kropachev K, Anderson, T. Lie Z, Kolbanovkiy M., Sugden, K, Martin, B. and Geacintov N. Base and Nucleotide Excision Repair of Oxidatively Generated Guanine Lesions in DNA. 2016 J. Biol Chem. 291, 5309-5319. Gremaud, J.G., Martin, B.D., Sugden, K.D. 2010 Influence of substrate complexity on the diastereo-selective formation of spiroiminodihydantoin and guanidinohydantoin from chromate oxidation. Chem. Res. Tox. 23, 379-385. Bergquist ER, Fischer RJ, Sugden KD, Martin BD. 2009 “Inhibition by methylated organo-arsenicals of the respiratory 2-oxo-acid dehydrogenases.” J. Organomet. Chem. 2009 694(6):973-980. Hailer MK, Slade PG, Martin BD, Rosenquist TA and Sugden KD 2005 "Recognition of the oxidized lesions spiroiminodihydantoin and guanidinohydantoin in DNA by the mammalian base excision repair glycosylases NEIL1 and NEIL2 2" DNA Repair 4(1) 41-50. Martin BD, Schoenhard JA and Sugden K D. 1998 “Hypervalent Chromium Mimics Reactive Oxygen Species as Measured by the Oxidant-Sensitive Dyes 2',7'-Dichlorofluorescein and Dihydrorhodamine” Chem. Res. Toxicol., 11(12) 1402-1410.